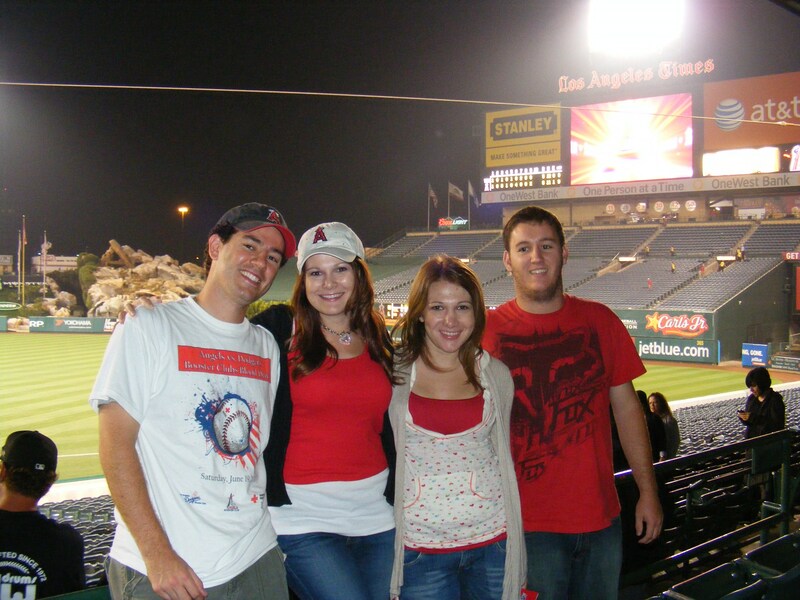 So, on the eleventh of September I headed out to Angel Stadium with Michelle to watch the Halos take on the Seattle Mariners. Of all AL West teams, I think I like going to Mariners games the most. They’re a lot of fun to watch. 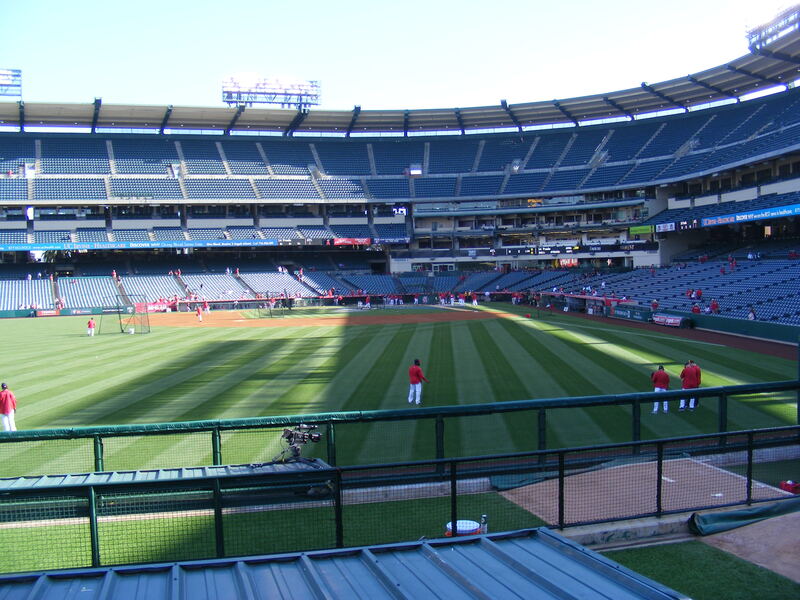 I ran in and spent the first round of Angels batting practice in the right field seats. 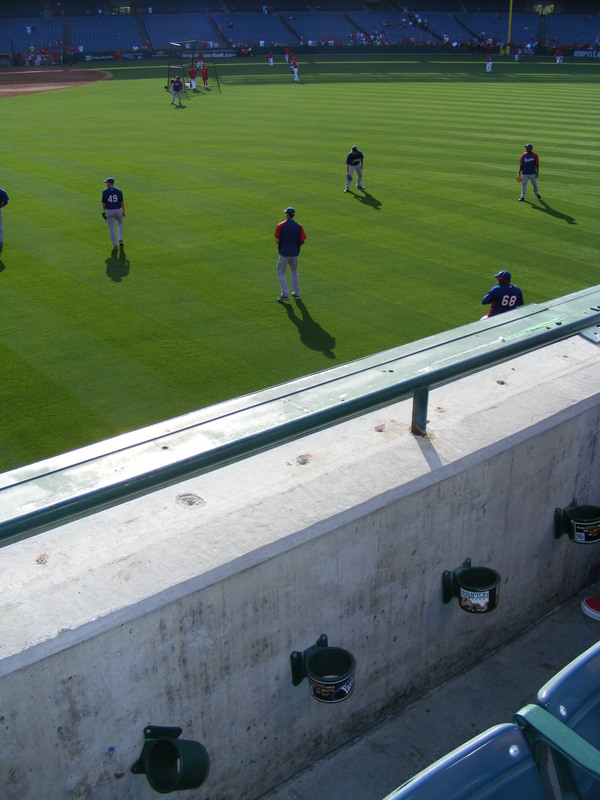 I didn’t snag anything up there and at the end of the round I walked down to the foul pole in right field. 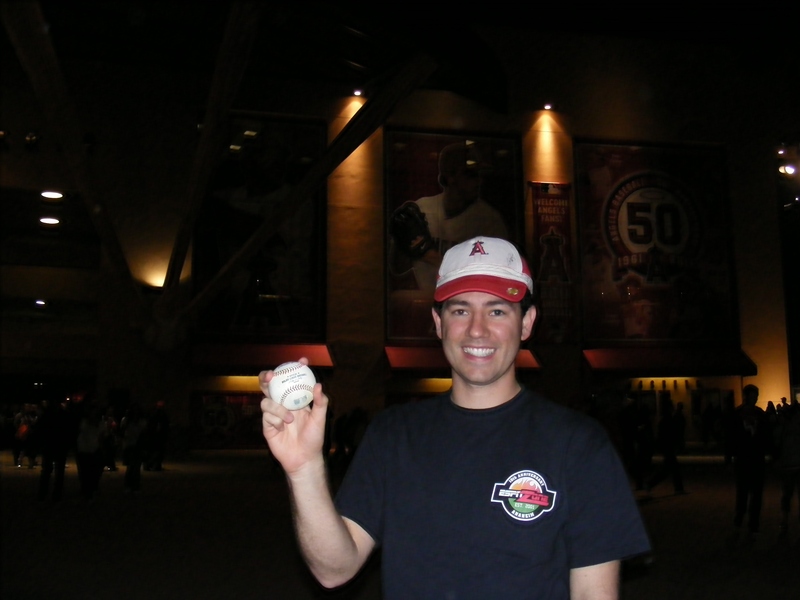 I wasn’t there more than a few minutes before I snagged my first baseball of teh day. 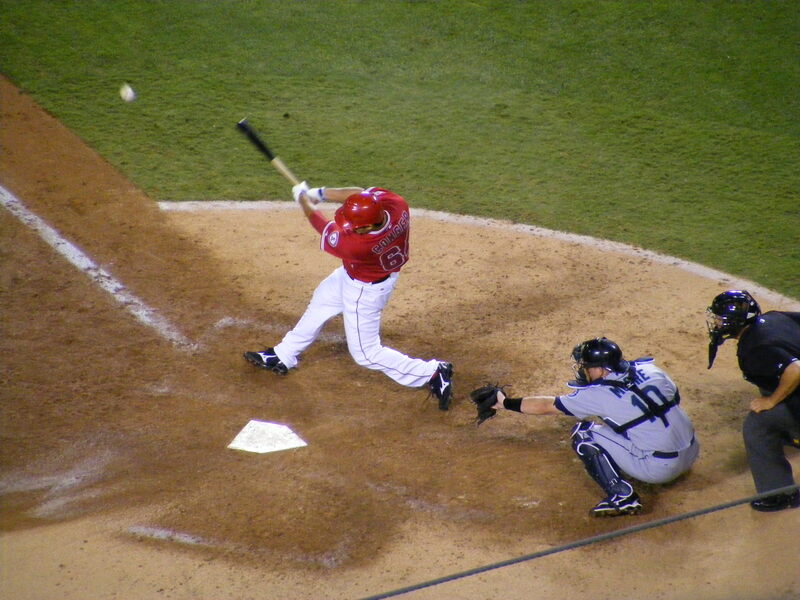 It was a foul hit by an Angels righty. It landed a few sections to my left. I was running for it along with a few other people and the ball took a crazy bounce toward the section I was in but a few rows further from the field. Then, it ricocheted off a seat a section to my left, then took a bounce and headed my way. 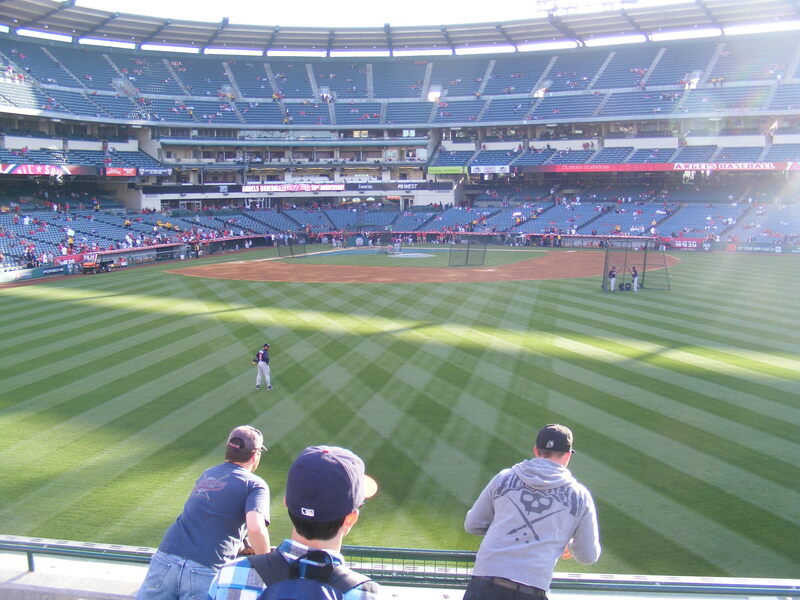 I ran up a few steps and grabbed it of the ground as it slowed down between sections 134 and 133 in the fifth row. First of the night–and 267th of my life. That was it for the home team’s half of BP. 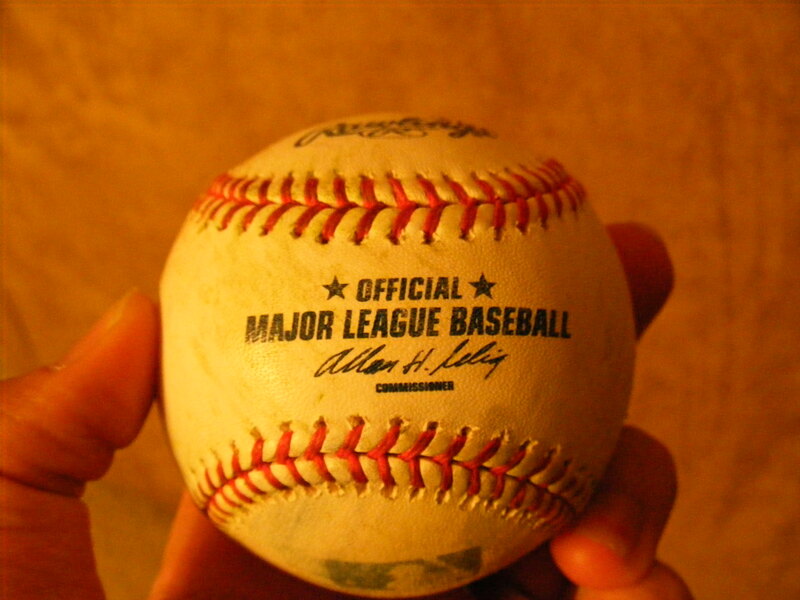 After the Mariners started warming up I got my second baseball of the day from relief pitcher Jamey Wright. It was a pretty standard toss from about twenty feet away after I couldn’t extend out over the fence to make a catch. The ball bounced over to Jamey and he lobbed it my way. 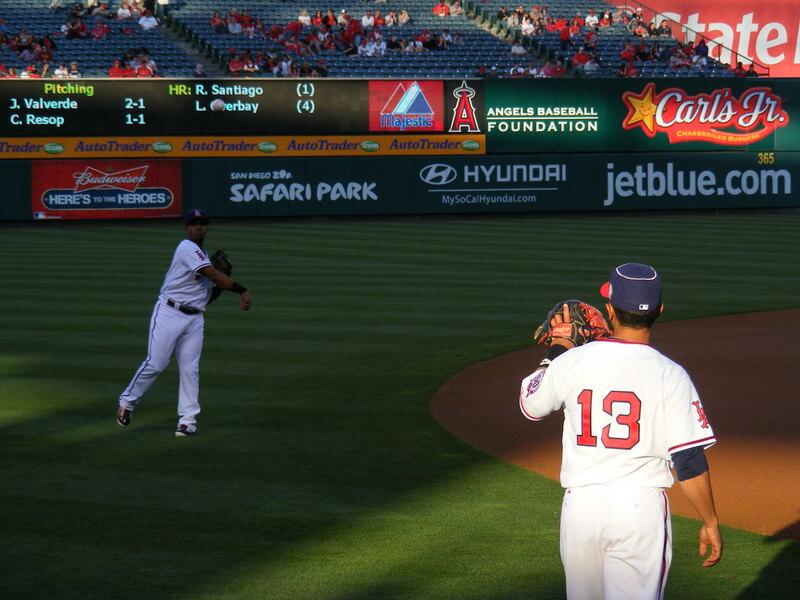 I gave that ball away later in the evening to a young Angels fan. 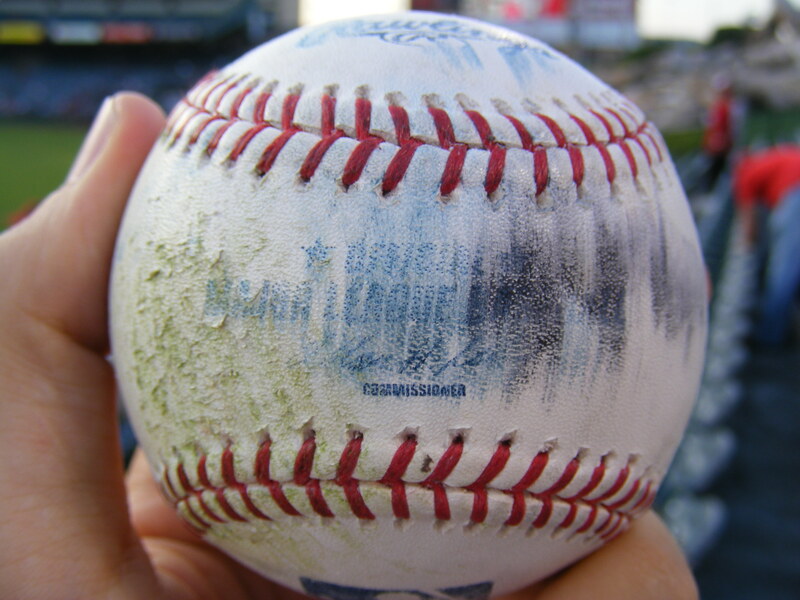 Note to everyone: Pay attention during batting practice. From my vantage point near the foul pole I watched a middle-aged guy in the front row of the pavilion get smacked in the head by a BP home run. It literally went bat to head. Knocked his glasses off, he fell to the concrete, ushers and security took him away–he walked off under his own power so that’s a good sign… but PAY ATTENTION! 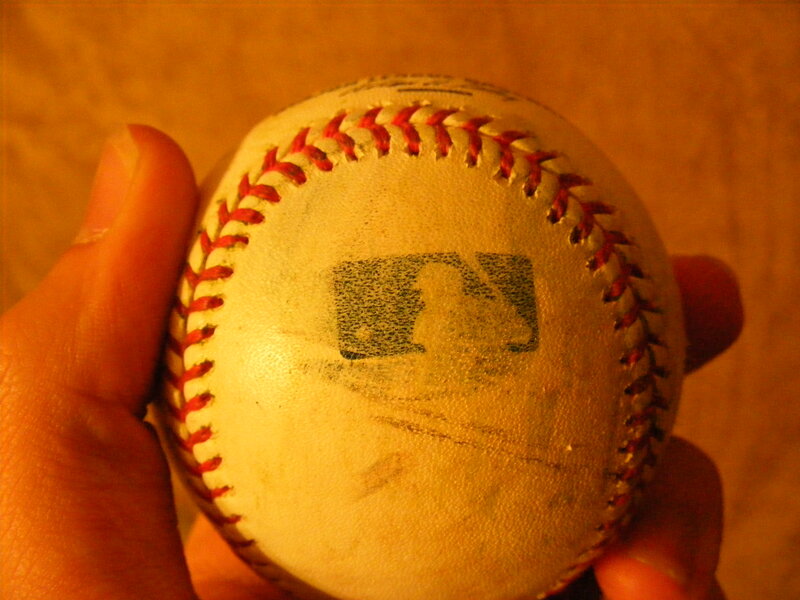 After batting practice I got shut out at the M’s dugout but I snagged ball #3 on the evening from Erick Aybar on the third base side after he finished his warmup throwing just before the national anthem. 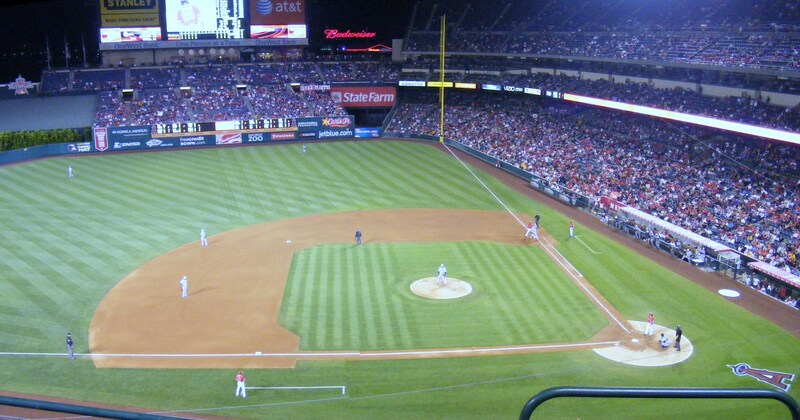 Michelle and I had seats in the upper level and we decided to sit up there so I could try to snag a foul ball. With Felix Hernandez and Ervin Santana pitching, I figured guys would be fouling a ton of pitches off. I was right–but it didn’t help me get one of ’em. 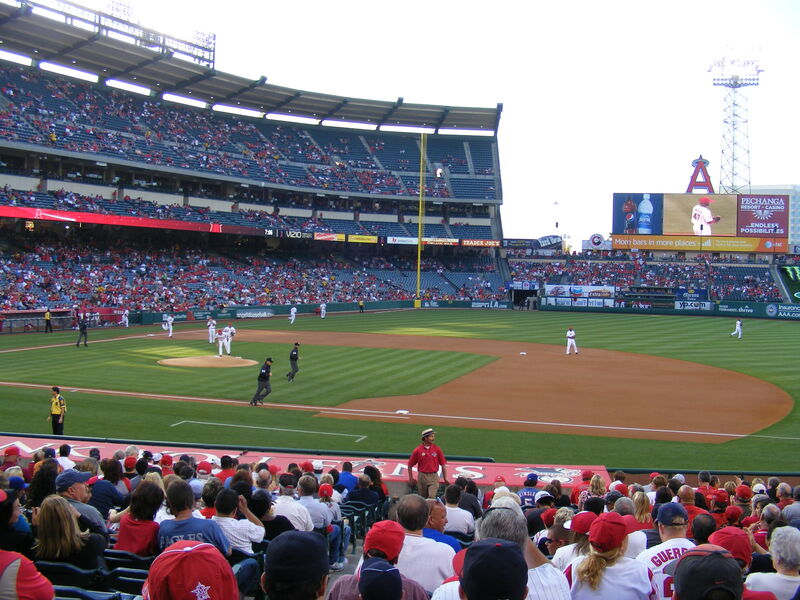 The Angels were up 5-0 after five inning s and 7-0 after seven innings. The highlight of the night was watching Santana mow down the Mariners and also getting to see Hank Conger and Mark Trumbo (two up and coming prospects) get their first at-bats of their careers. Conger made contact… but struck out. 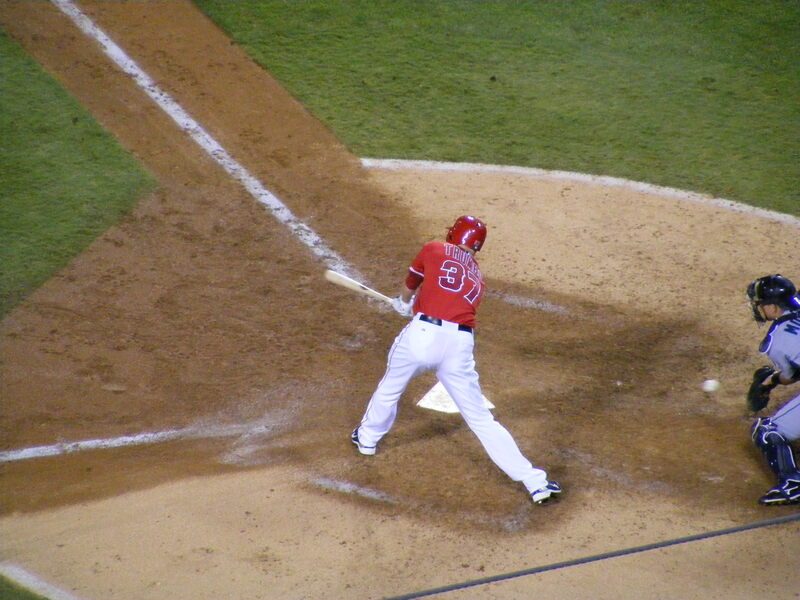 Trumbo whiffed on three pitches and looked bad doing it. Hernandez is a tough assignment for your first MLB at-bat, I guess. 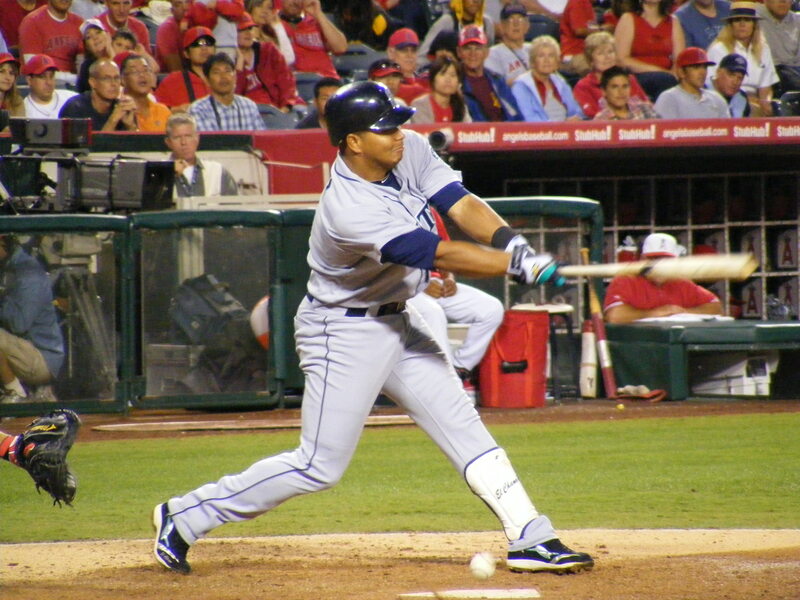 Santana was shutting out the Mariners for seven and a third spectacular innings before giving up a home run to Ichiro with two men on. That ended his night. The bullpen did well to help bail him out and earn Santana the win. Taa-daa! Kevin Jepsen threw him a fastball that Lopez barely got a piece of. I took the photo, then put my camera down and, well… Ball #4 on the night and my 270th of my lifetime! Over to the right is the ball and the point of view from where I was sitting. It happened pretty quickly and I was lucky to get a shot of the foul in action. Luckily, it wasn’t a line drive or I might have gotten clocked–it took a nice bounce though. That’s for Tim and Todd. 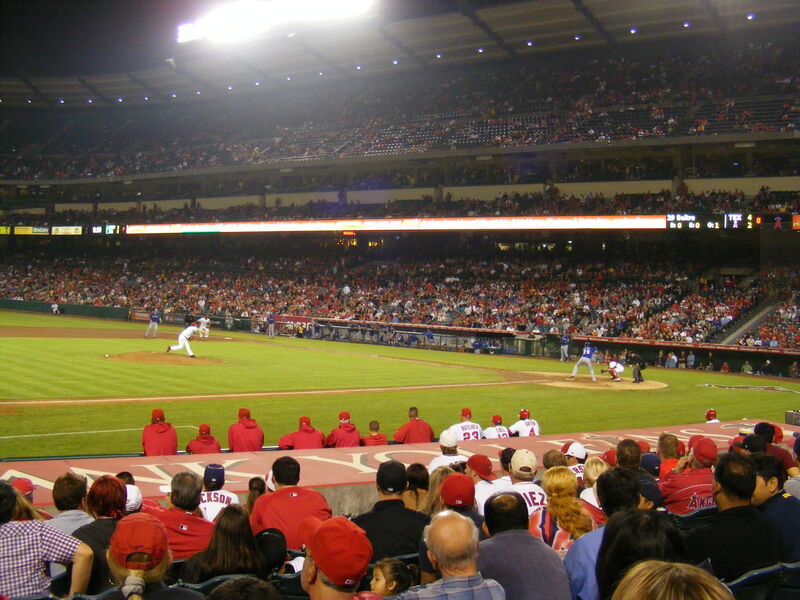 The Angels would hold on for the victory, 7-4. 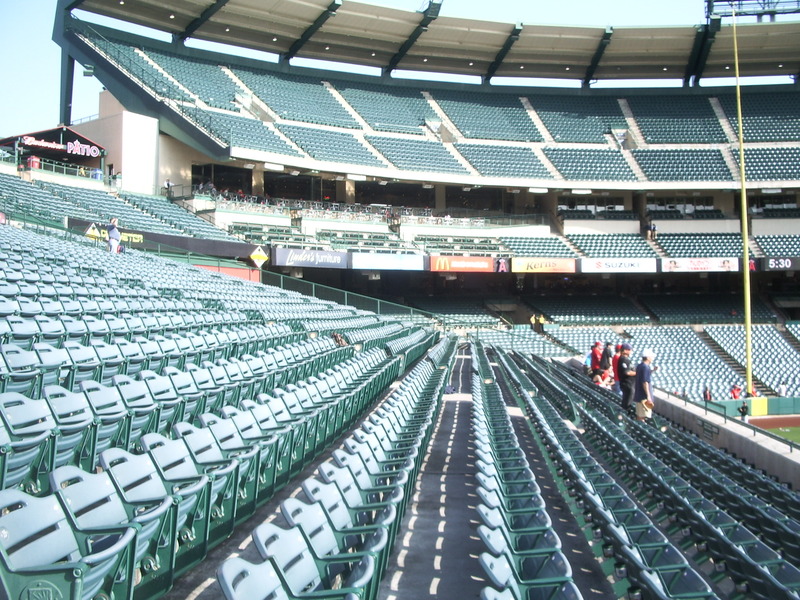 By that point at least half of the fans had left. It was And there were fireworks after the game. 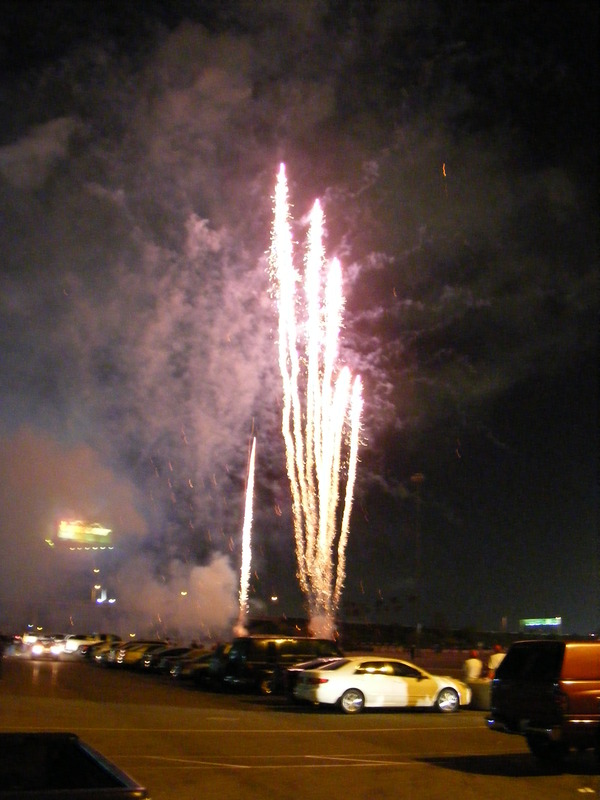 Michelle and I walked to the car and passed by the staging area… this was a much better fireworks view. 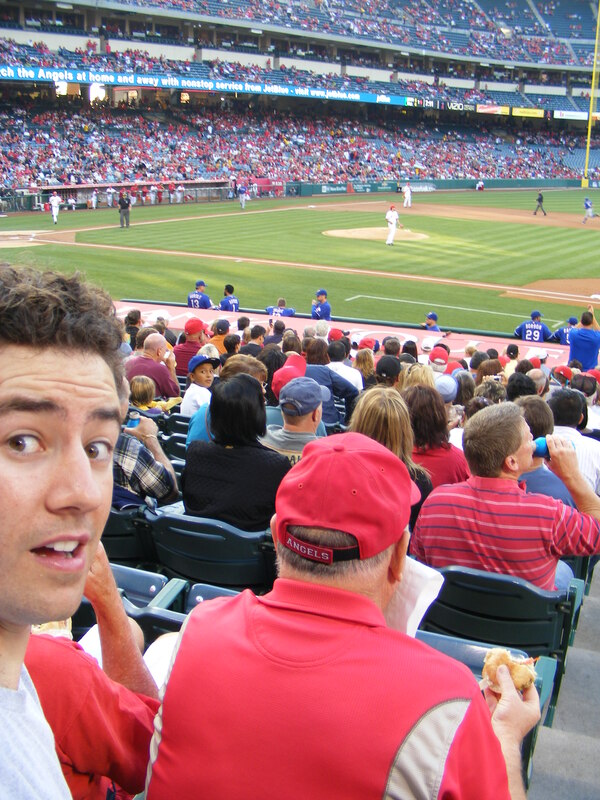 I’d only go to two more games this season–both at Angel Stadium–and by now you know the Halos didn’t make the playoffs… not even close. But we had a great time and I added four baseballs to my total. A night well spent. Always glad to see the home team pound out a win. Today would be a special day. 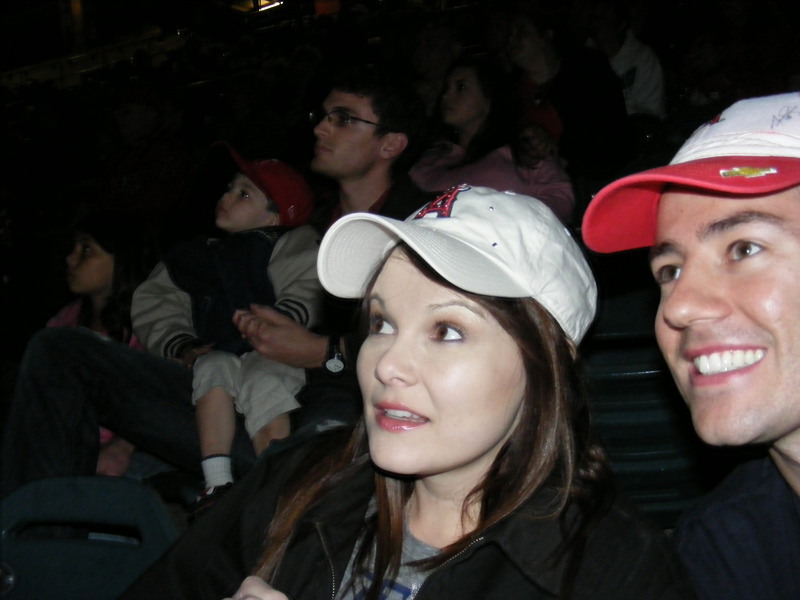 I mean, every day that I head to a big league ballpark is special but on this day I’d be attending the game with Michelle and her sister (Crystal) and her sister’s boyfriend, Jeff. 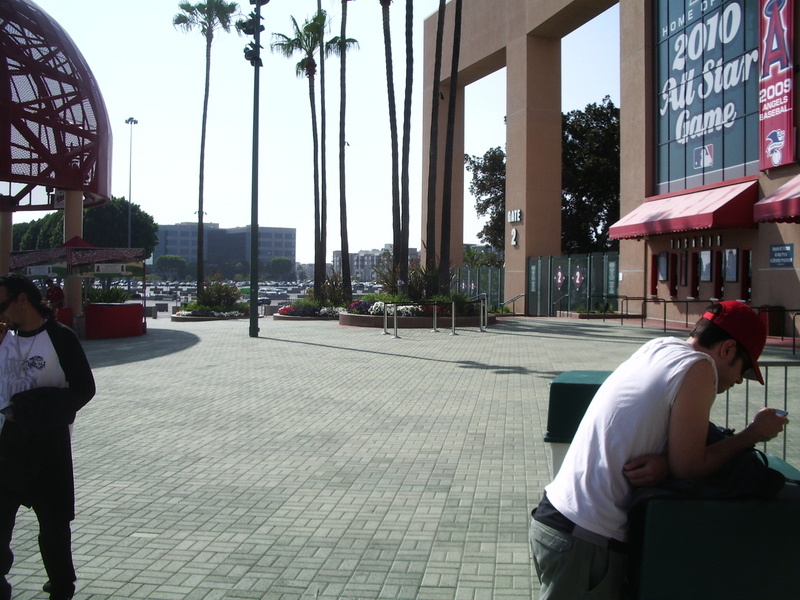 And this would be Jeff’s first baseball game… ever. The day started out like most game days for me. 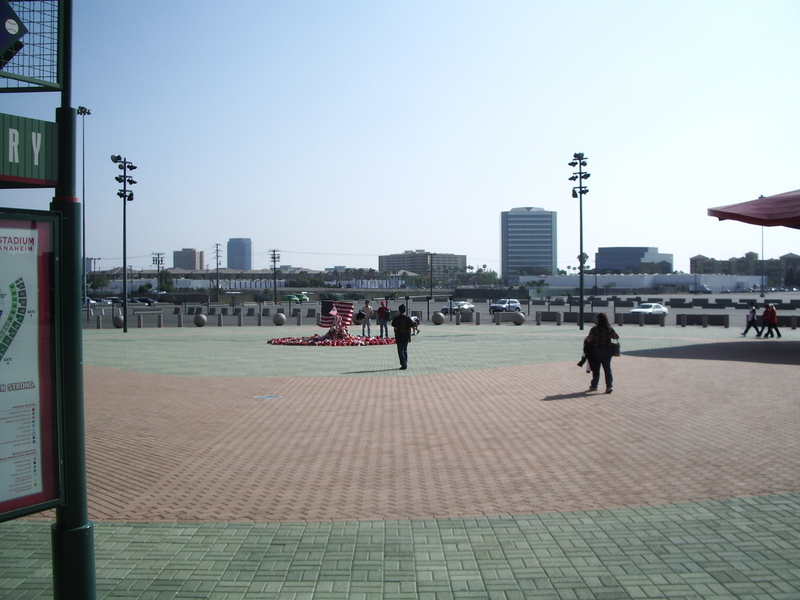 I left my place around four o’clock and got to the stadium–then I waited for the gates to open. While I was waiting I saw a young kid named Kevin (who is a regular commenter on this blog) who I’d first met in person back on May 28th. We chatted while we were in line together and exchanged strategies. Kevin, I should mention, was decked out in full Rangers gear–and he’s a kid and he knew what he was doing–he ended up doing very well for himself, snagging-wise. 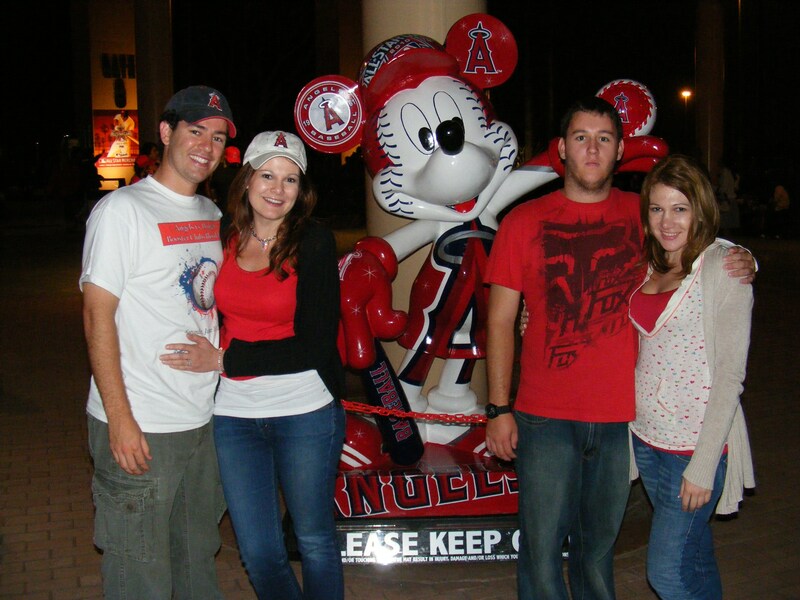 The rest of my group would be arriving after batting practice was done (Jeff had class and Michelle had work). I made the most of my time spent alone at BP. 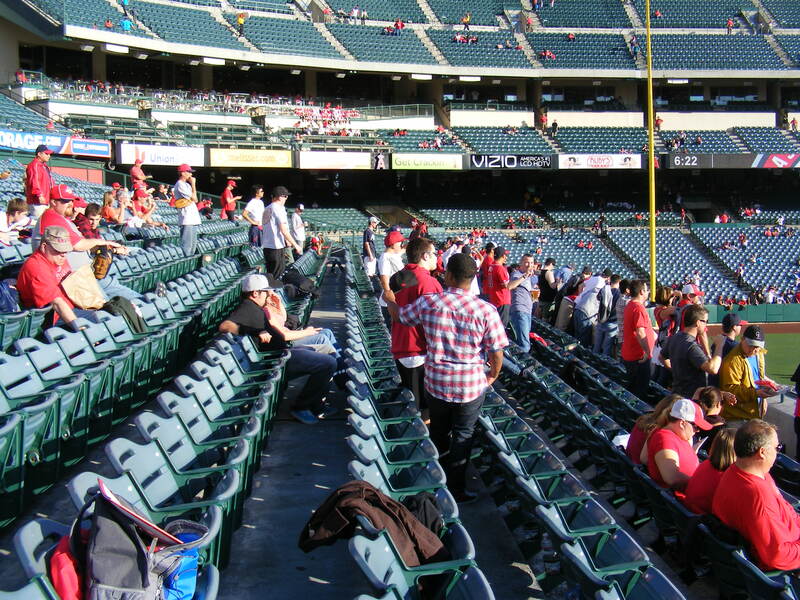 It was fairly lonely up in the right field seats. Just the way I like it. Lots of room to maneuver and run around. See that red box in the above photo? That’s important later on, I promise. 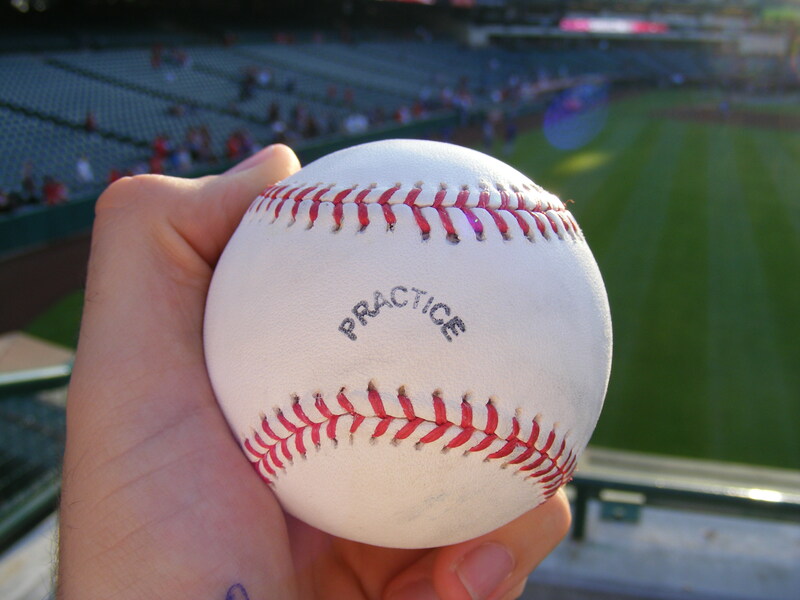 Unfortunately, I didn’t snag a single baseball through the first round of batting practice. 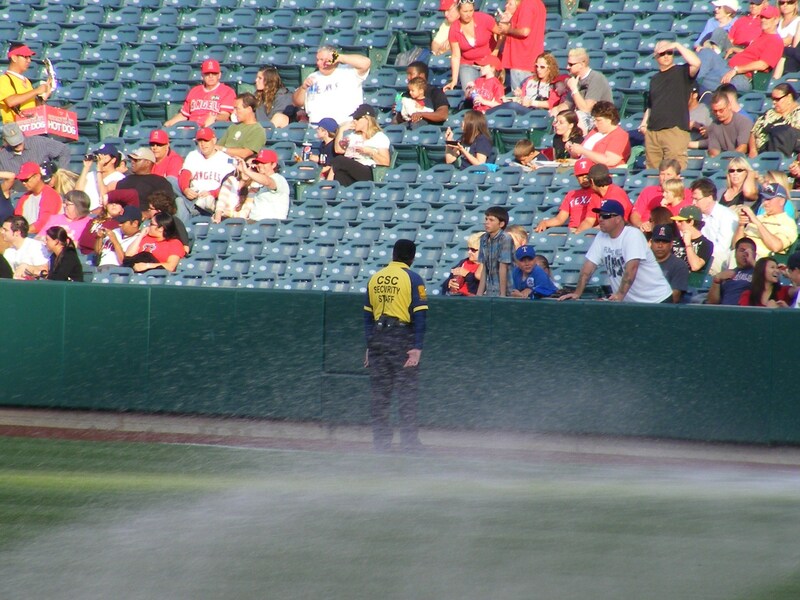 For the second round I stood at the wall near the foul pole in right field and waited. After a few minutes a scorcher hit the wall to my left and I planned to play the ricochet. It came toward me, I jumped out onto the wall… and the ball went into my glove but I couldn’t trap it… it rolled a foot away. 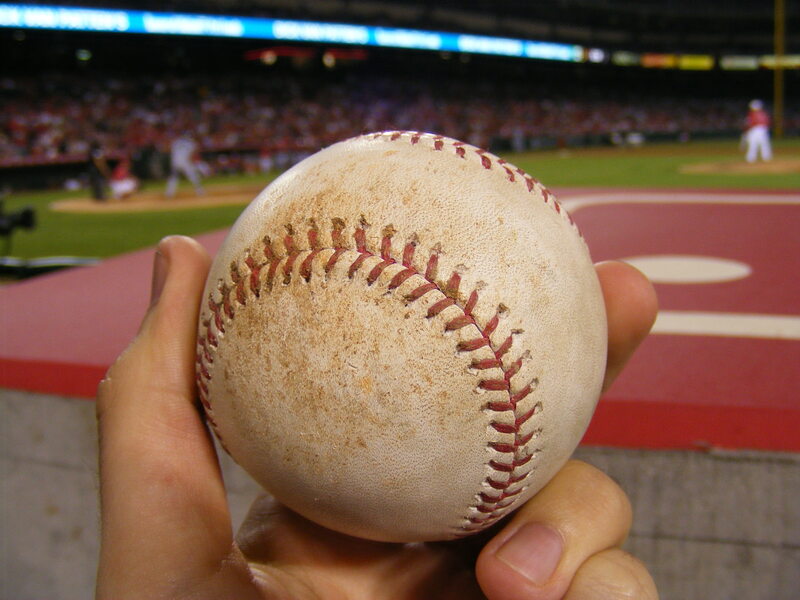 I figured I could still reach it so I stood up and then tried again, keeping my glove on the end of my hand to give myself another couple inches… I stretched out… the ball was just a few inches away. And then I felt something hit my legs and I panicked–was someone pushing me over onto the field?!? “Excuse me, sir,” the stern voice said, “Sir–can I see your ticket?” The SCS security guy that had been standing in the right field corner had come over. I told him that of course he could see my ticket. How weird. 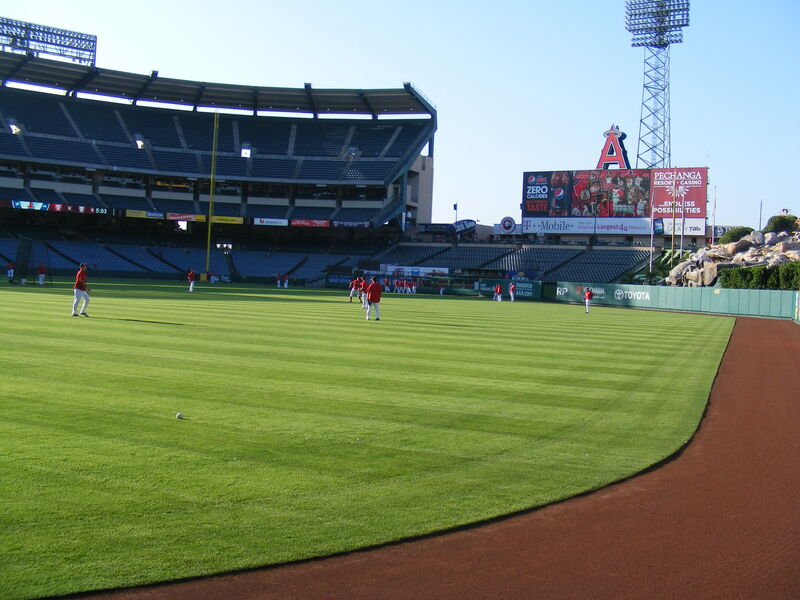 During batting practice you can go anywhere on the Field Level that you want at Angel Stadium except behind the dugouts. I showed him my ticket–he’d asked for Kevin’s dad’s ticket and he had handed it over, too. “For being unsafe on my field!” He actually yelled at me at this point. poorly and I will be filing a complaint. I was hoping to get a badge number or something… I will update this blog if anything else happens involving this guy. field. And he kept a young fan from getting a souvenir. seat) as the Rangers took the field. the fly in a month… well, it wouldn’t take me another month to catch another one. 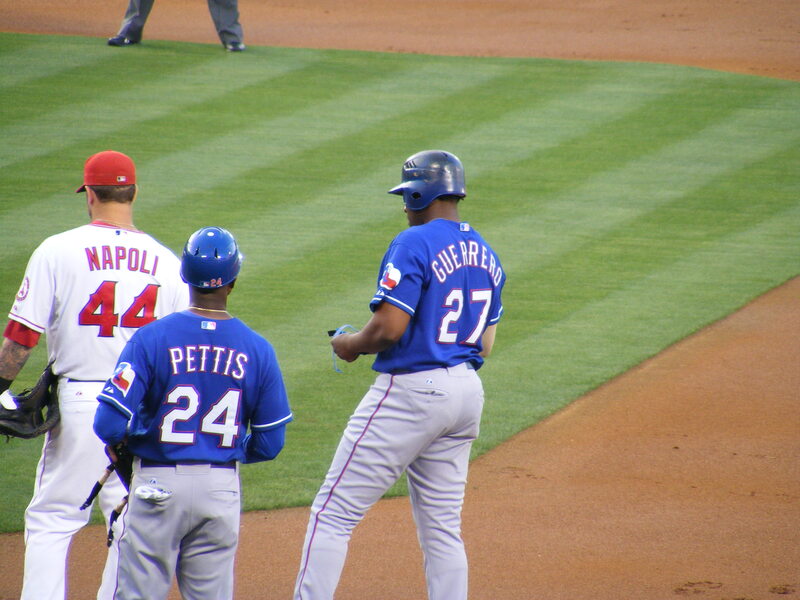 I was playing plenty deep for Josh Hamilton and Vlad Guerrero was hitting right after him. For Vladdy, I moved close to center field since he’s right handed. 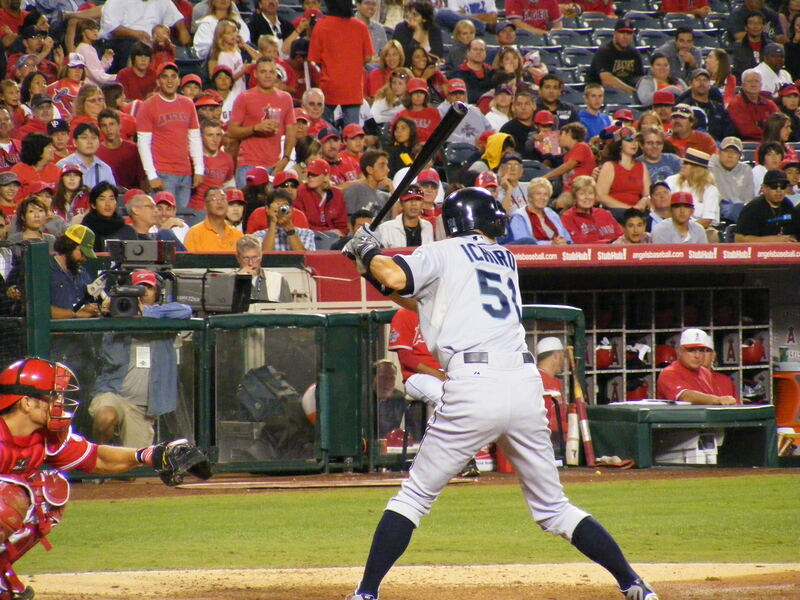 I knew he could hit them out to left–but I was hoping that he would go opposite field. He did… big time. I caught the Hunter homer in the third row of Section 240–Vlad launched one to right center field and I moved back and to my left and managed to catch a homer off his bat in the ninth row of Section 239. That’s even farther from home plate (well over 400 feet) and even more toward right field. Wow. And that’s why the red box in the first photo is important–that’s where I caught the ball. You can click on the photo to enlarge it if you want. It’s fine… I’ll wait. That’s a long opposite field home run. After he hit, Vlad took some fly balls in the outfield and got a nice ovation from the fans–and when he finished he signed some autographs over on the foul line. Classy. 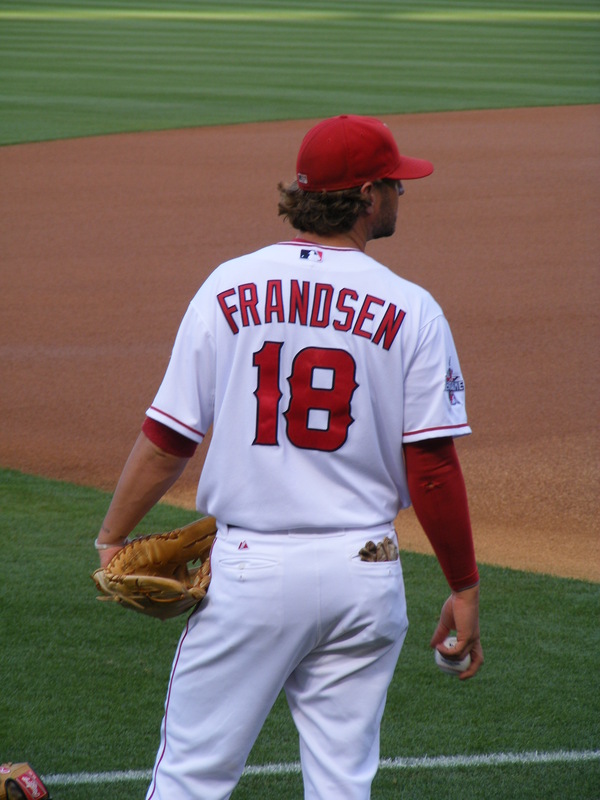 He’s having a great year and all the Angels fans appreciate the work he put in for our team from 2004 to 2009. I ran down to the dugout at the end of BP and tried to get a ball from Johnny Narron–and noticed Kevin right next to me–and Narron threw the ball to Kevin. If only I were fifteen years younger! Aagh! 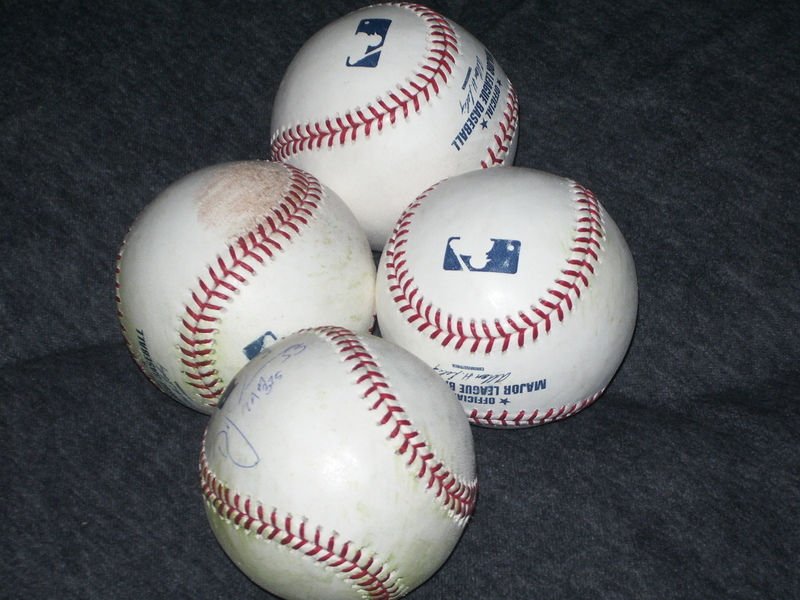 My fourth ball of the day would come from Angel shortstop, Erick Aybar. 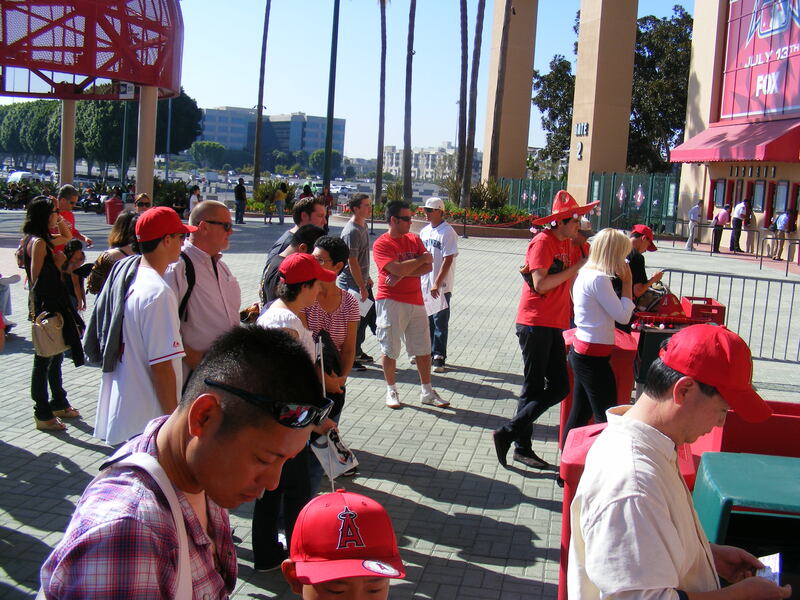 There are always a ton of fans near third base before a game in Anaheim but they almost all are trying for autographs. 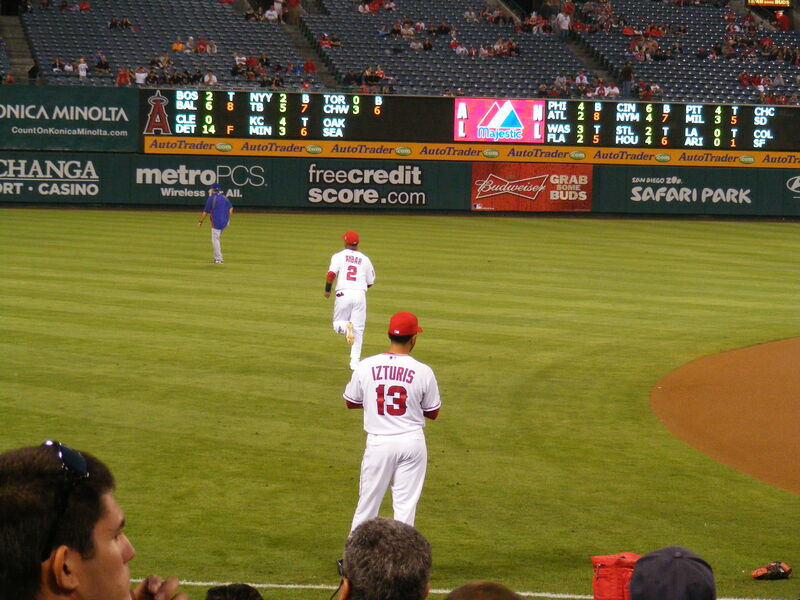 I was a few rows from the wall as Aybar and Frandsen played catch and I simply yelled out, “Erick! 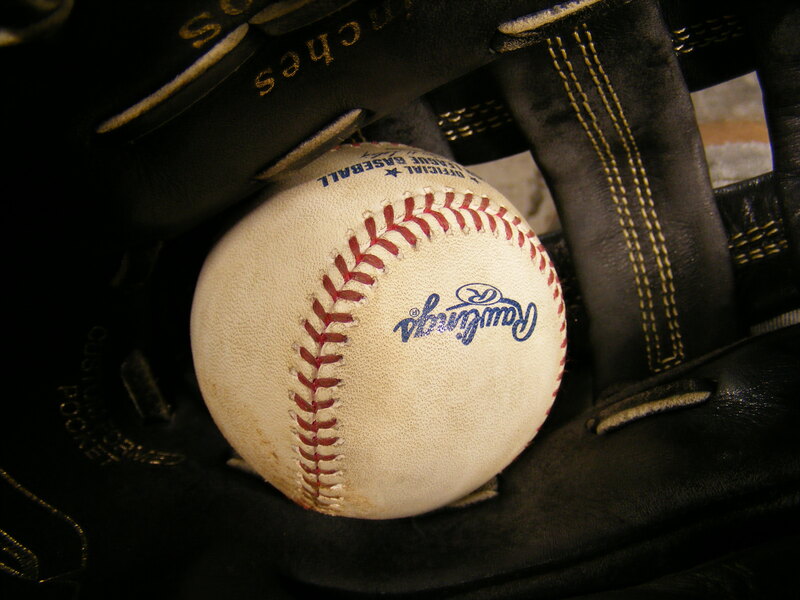 Right here!” as loud as I could when they finished up… and held up my glove. He tossed that ball in the above photo to me for Ball #4 on the day. Michelle, Jeff, and Crystal still hadn’t arrived at that point so I went to find a seat near the Rangers dugout. It worked! 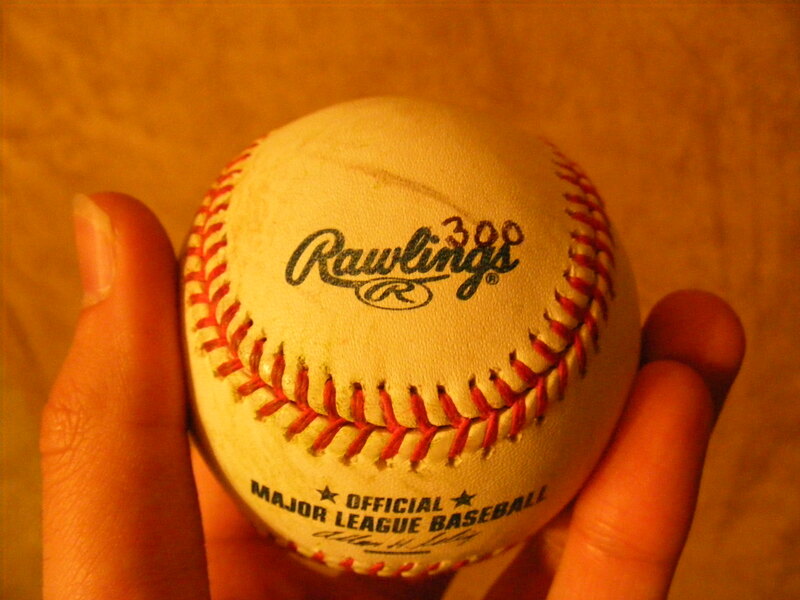 He looked over and the girl tossed him a baseball and a pen–then I tossed him a baseball and since he already had the girl’s pen he didn’t take my blue ballpoint. I got the autograph–but it was less than ideal… but I was still thrilled. 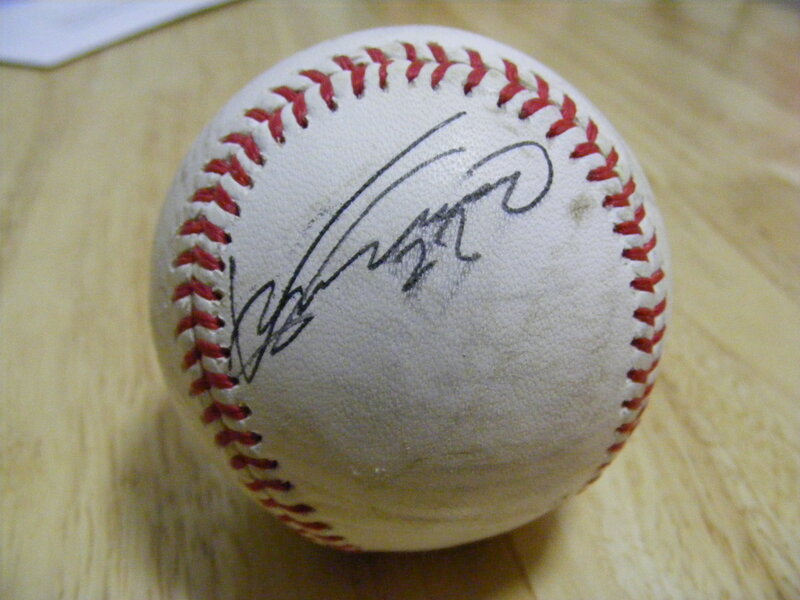 He’d signed the ball I’d caught just a half hour earlier! 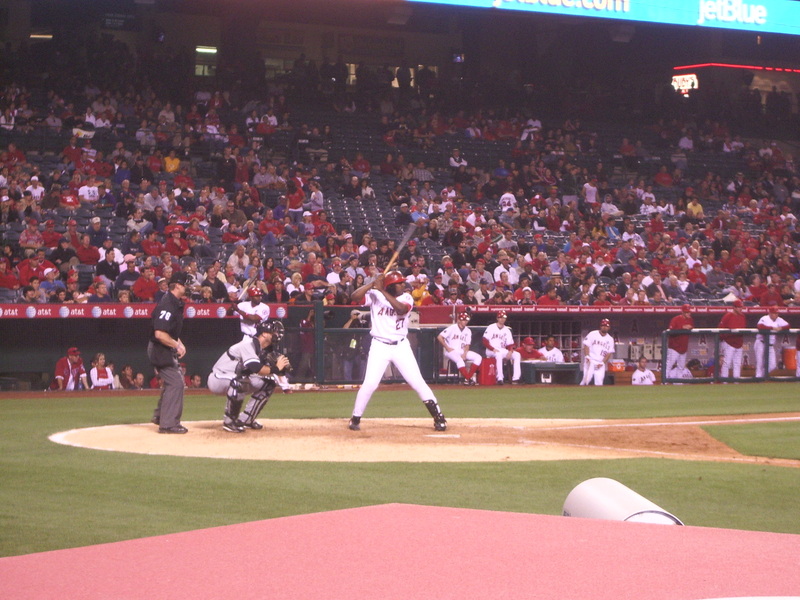 I should mention that I’d never gotten a ball from Guerrero before–in all his years as an Angel he hit before the gates opened… so I never saw him during BP. Woo! 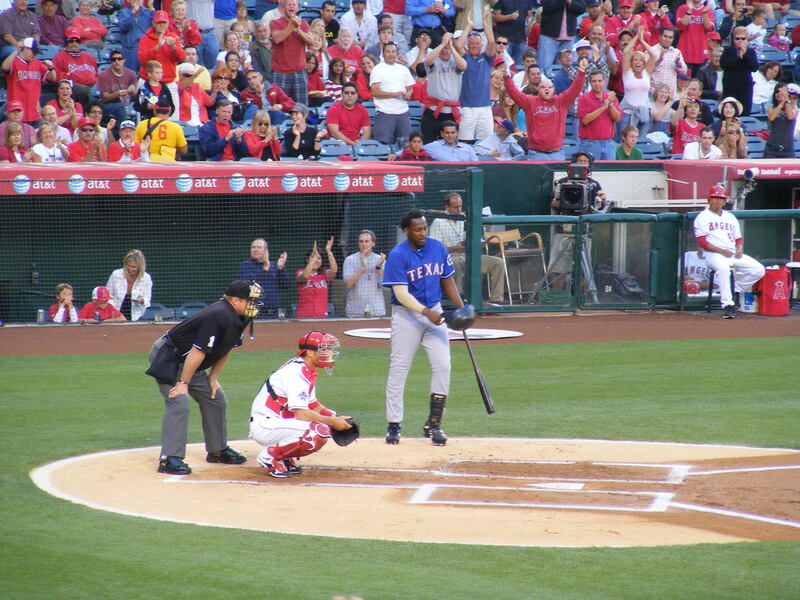 And Vladdy got a standing ovation when he stepped into the box–then hit a single. 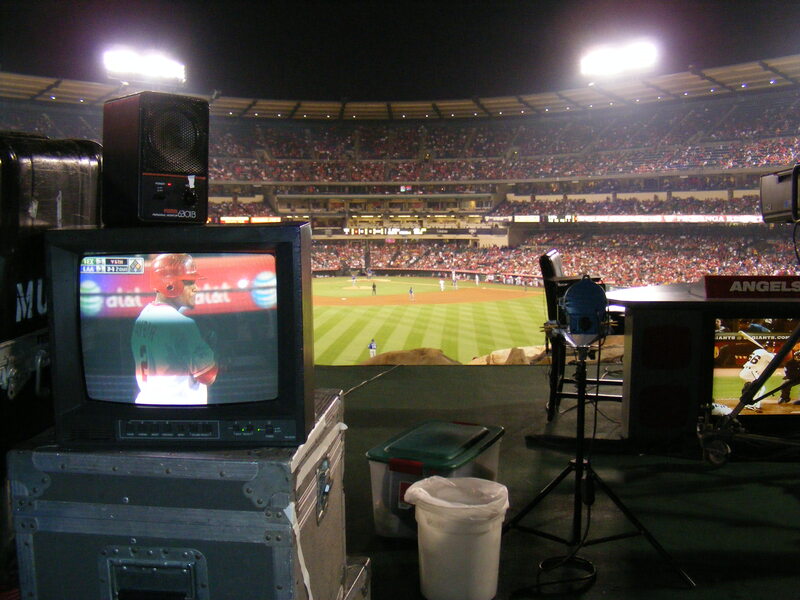 Angels/Rangers on your left… Dodgers/Giants on your right. nings. 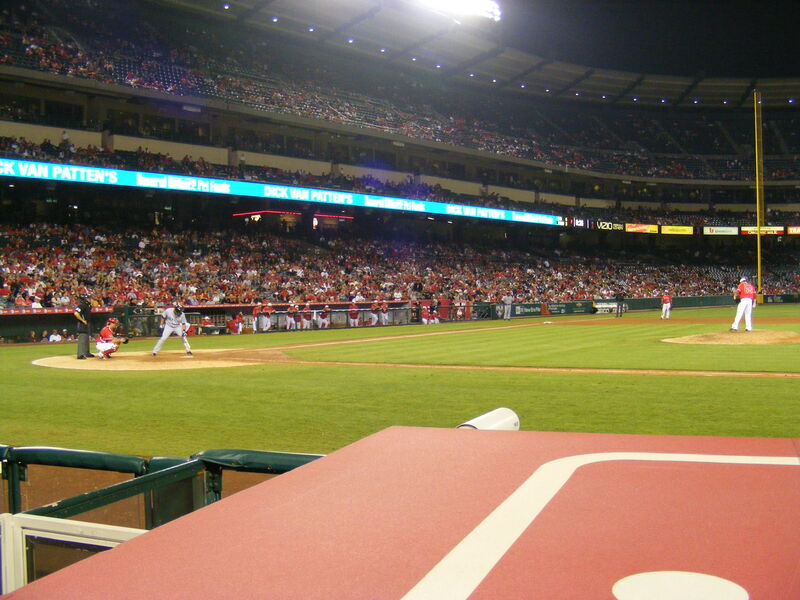 The Angels were winning but the Rangers had made it a close game–it was 6-5 Angels when we sat down. And that’s the way the score stayed. It was a great win over our division rivals and, even though they’d lost, I headed down to the Ranger dugout after the game. As the players retreated to their clubhouse nobody tossed a baseball up but the bullpen guys were still making their way in. As they got close I held up my glove and asked for a ball. One of the Texas relievers had a ball in the pocket of his sweatshirt–but looked to my right. I turned… there was Kevin. He got that toss-up, too… which I could’ve easily snagged if I was a mean, greedy adult. Kevin looked up at me and thanked me for letting him get it. I told him it was no problem and asked how many he’d snagged that night. Jeff looks very stern but I swear he had a great time at the game. Michelle and I walked them to their car under the light of the Halo and then we headed to our own and drove back to Irvine. What a great night! I attended this game by myself. Michelle was prepping for wedding things with her family and I ended up selling my extra tickets on craigslist. 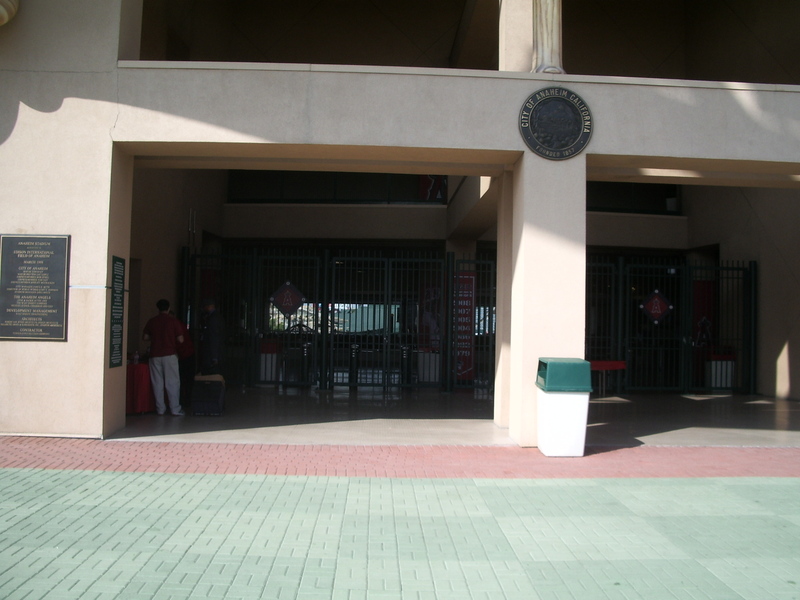 I arrived at the Home Plate Gate at about 4:30pm for the 7:05 start. 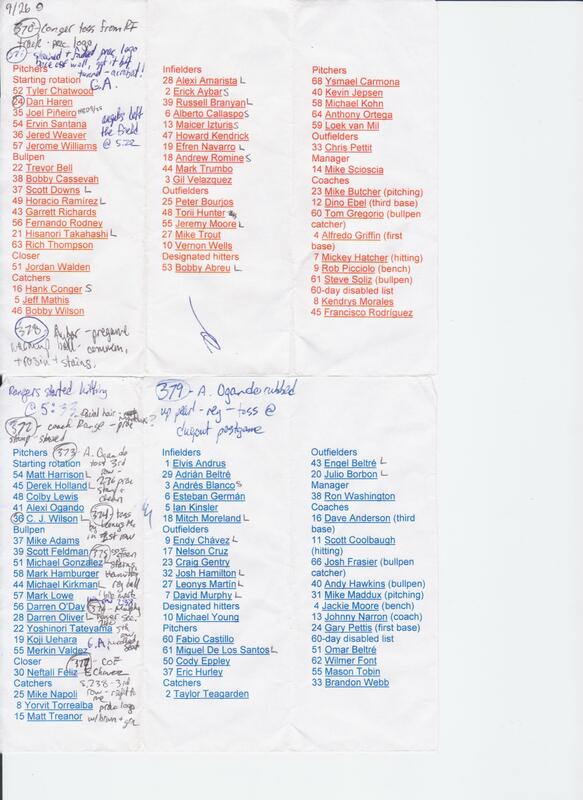 When I got there, here’s how many people were around. 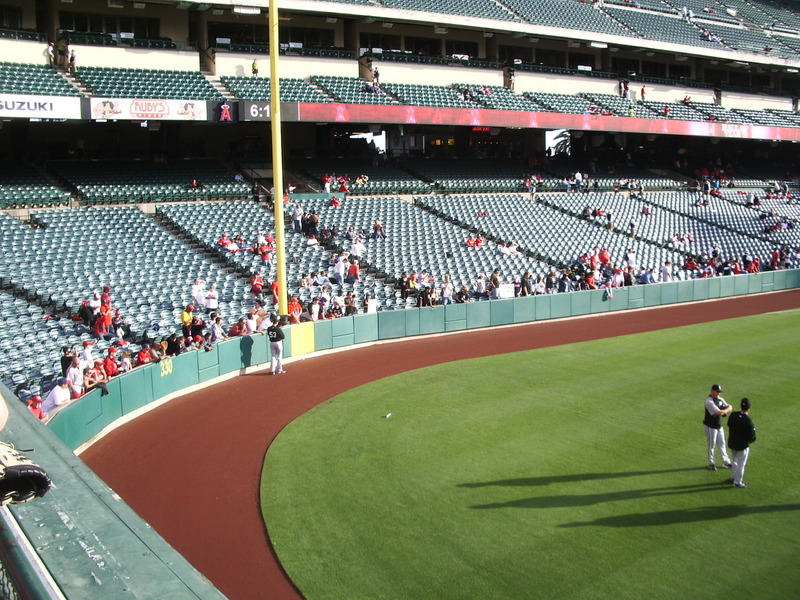 While time passed I realized that there would be a pretty light crowd for batting practice. 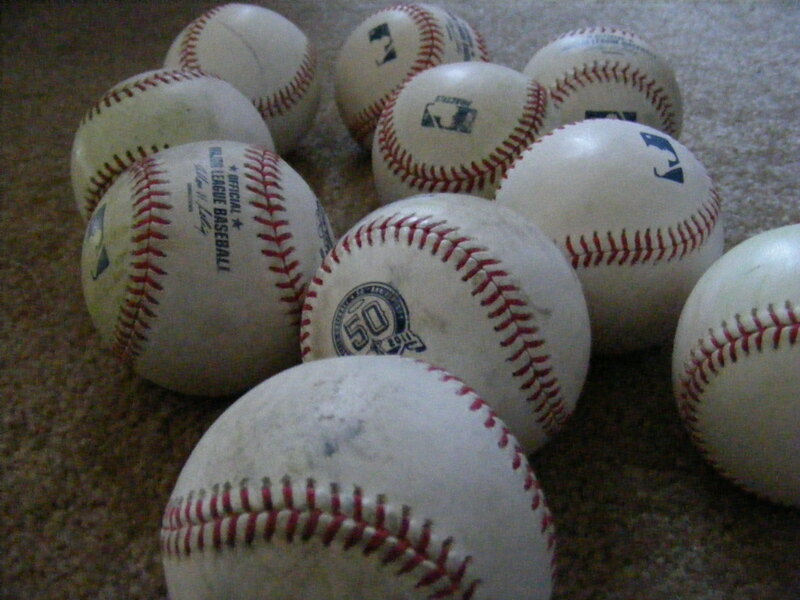 I remember thinking I’ve got to to better than one baseball today. I knew this would be my last game for a while so I was hoping to have a really good time even though I was by myself. 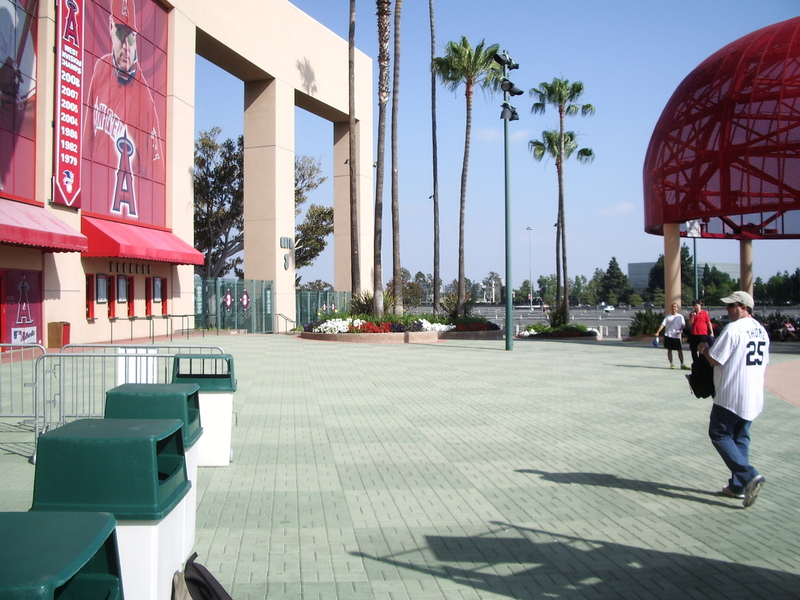 A BP regular named Terry introduced himself to me as we were waiting for the gates to open. He then started talking to a guy that would race out to the pavilion with me at 5:00… we ran the whole way and I stayed right on his heels. Unfortunately, there were no Easter eggs to be found. 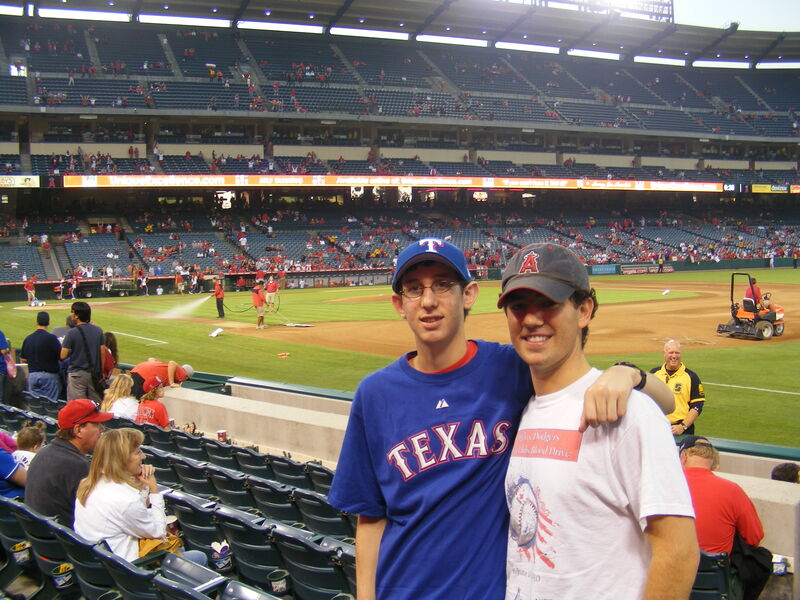 I did end up introducing myself and found out his name is Rob, I had seen him at nearly every BP I’d been to at Angel Stadium since last summer so it was nice to finally meet. I owe my first ball of the day to Rob’s generosity, actually. Kendry Morales smashed a deep drive over both our heads and we both were running for it as the ball bounced through the seats. Rob was just a few feet ahead of me but he definitely gets the assist on this one for letting me have the ball even though he totally got to where it was first. Thanks, Rob. 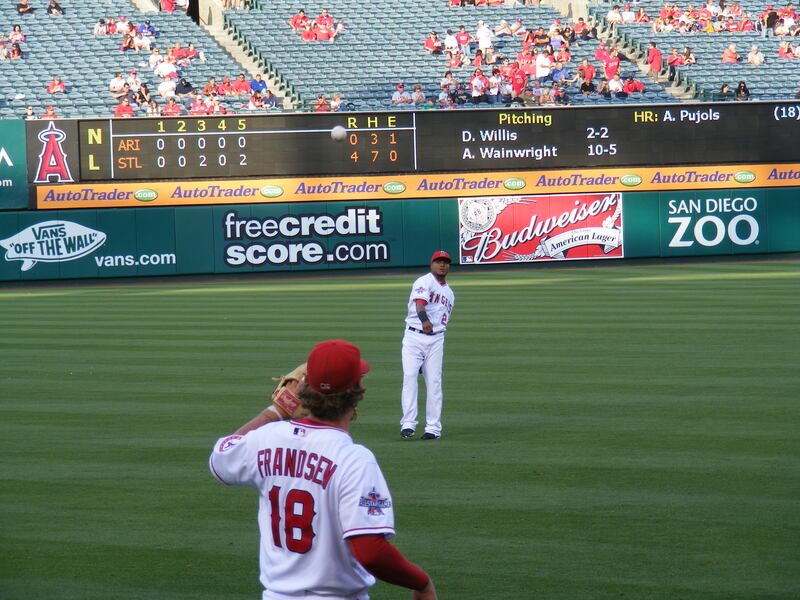 Later I saw San Diego ballhawk, TC, in the stands (who I recognized from Zack’s blog) and said hi to him, too. I was making all kinds of new acquaintances at this game! 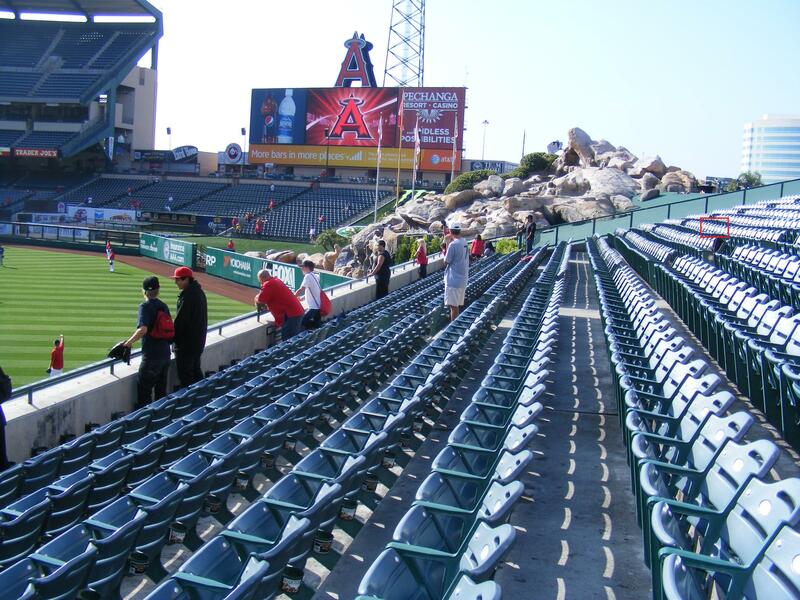 It slowed down a bit, though, and I didn’t snag another ball until the last round of Angels BP. Erick Aybar (showing a bit more power of late) smacked one that just cleared the 18 ft. wall in right and I moved a bit to my left to catch it. Ball #3 on the day and the 56th ball in my collection! I did manage to get the attention of D.J. 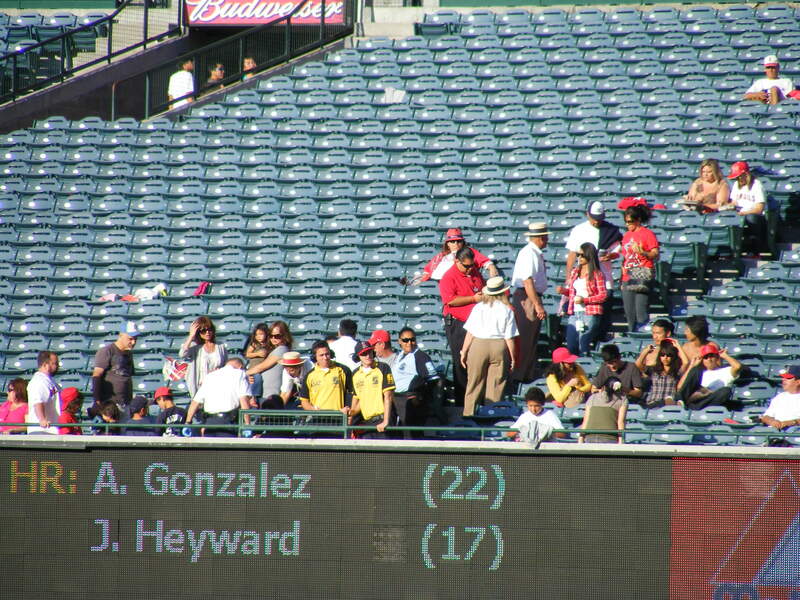 Carrasco (in the #53 jersey, above) after he signed a few autographs near the foul pole. He started talking to Octavio Dotel (on the right, above), who’d been messin’ with a few Sox fans: faking tosses to them, saying he would sign ALL the autographs they wanted–from 18 ft. below them, etc. and then D.J. fielded a ball. I called out for it from about ten rows back, “Hey, D.J., how ’bout one up here, please?” He looked up and said, “What happened down here?” gesturing toward the Field Level seats near the pole. I told him, “You want me to go long? Yeah, I’ll catch it.” He laughed and I put my glove up. He threw me a strike… and he threw it hard. Remember that conversation for later. Perfect. 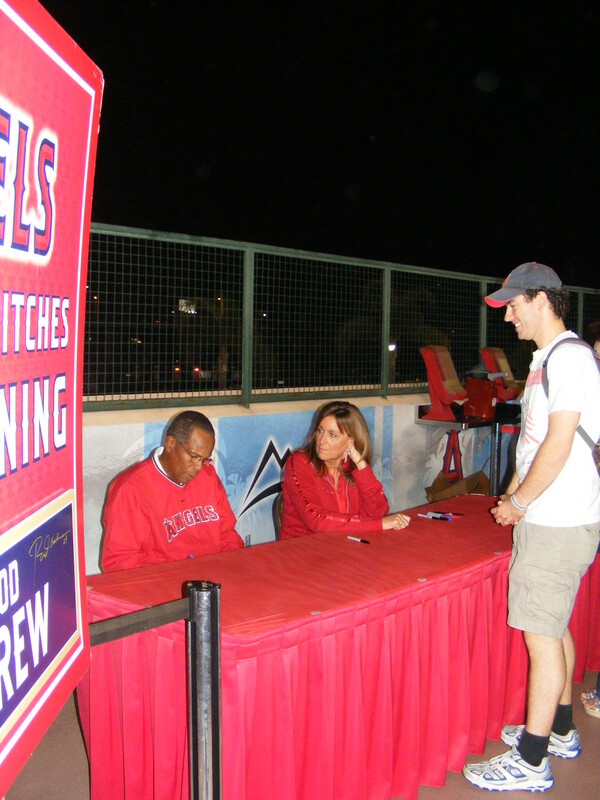 I thanked him and told him he’d pitched well the night before. He said, “Thanks,” and that was my fourth ball of the day. Sweet! 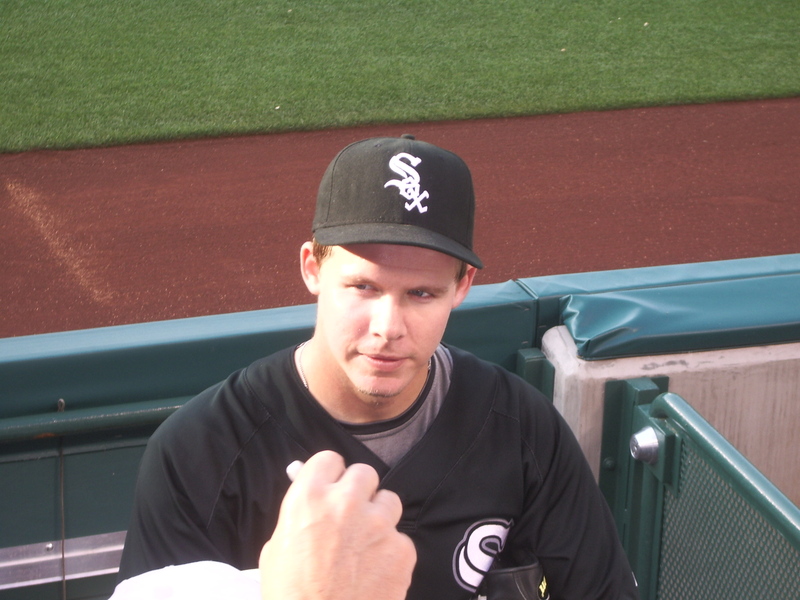 BP kind of died after that… I got dissed by Matt Thornton for the second day in a row. I even tried the, “How about a ball for another Matt?” that had worked on Matt Palmer two weeks earlier. No luck. 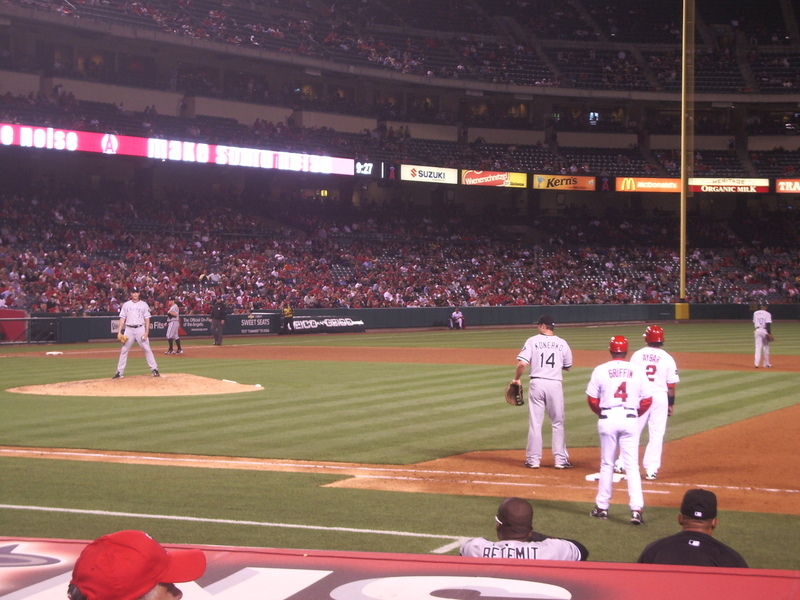 Then I settled in for the matchup behind the dugout. No infielders warmed up before the first inning, so no baseball there. 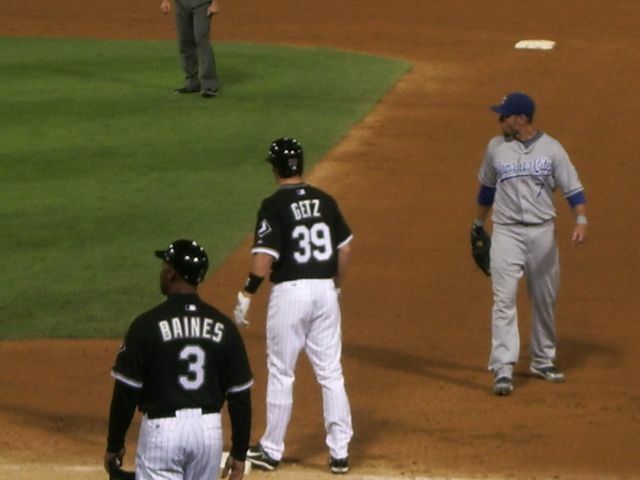 And, try as I might, I couldn’t get Paul Konerko to toss me a third out ball all game long. I was close to one but rather than trample the little kid next to me I opted to stay stuck at four. A lot of foul balls came near me but I couldn’t get a glove on any of them. 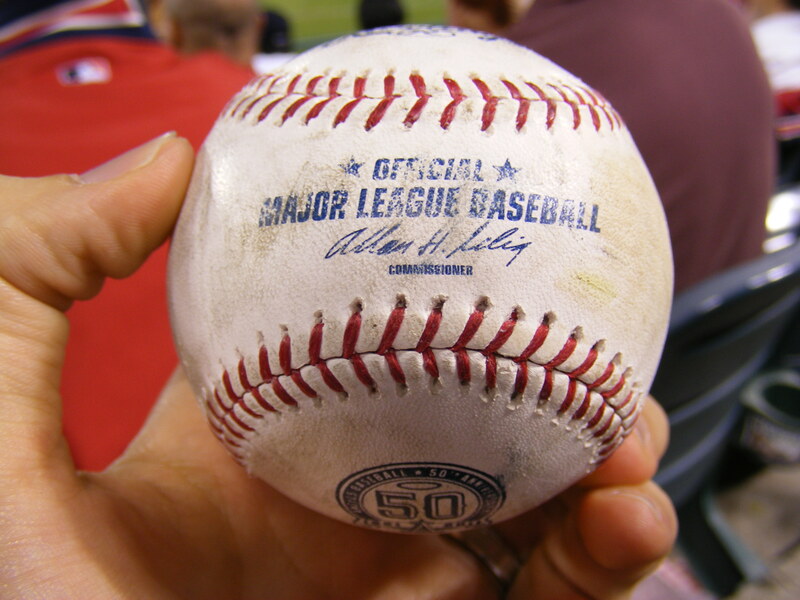 That’s my new goal: to catch a foul ball… as it seems that my next baseball will put my at thirty for the season (a humble goal I set for myself in April). 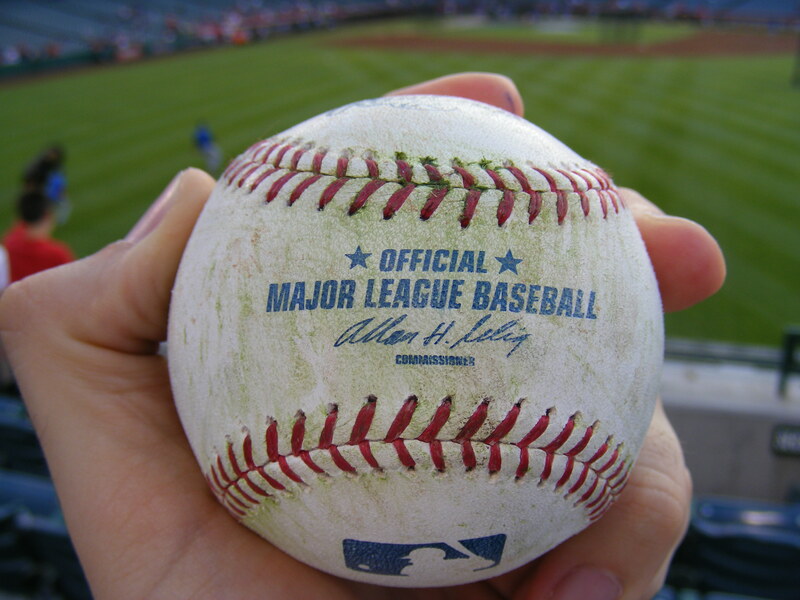 Foul ball, here I come. The game was alright… the Angels lost 4-2, which wasn’t terrible considering the slaughter they suffered the night before. 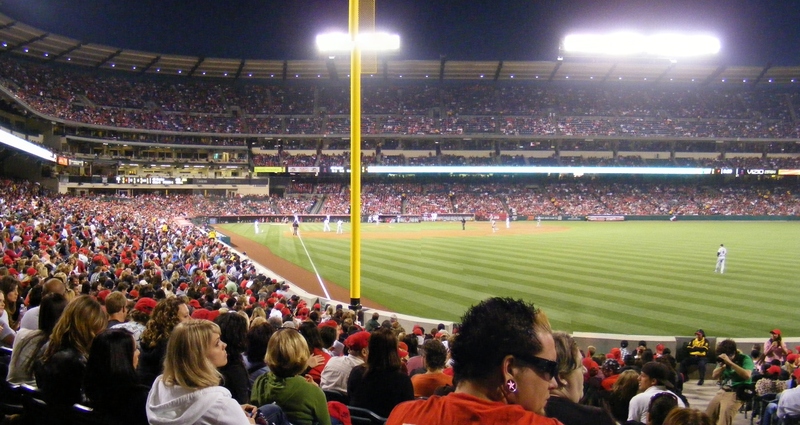 There were 38,040 fans in attendance… about 5,000 less than the previous evening. Bobby Abreu hit his first home run of the season… maybe that’ll get him going. Vlad got a hit, his first since coming of the DL… it was a single (BAH!). And Joe Saunders pitched well, giving up only 3 earned runs in 6+ innings. Bartolo Colon pitched for the White Sox (remember when he won a Cy Young Award in ’05?) 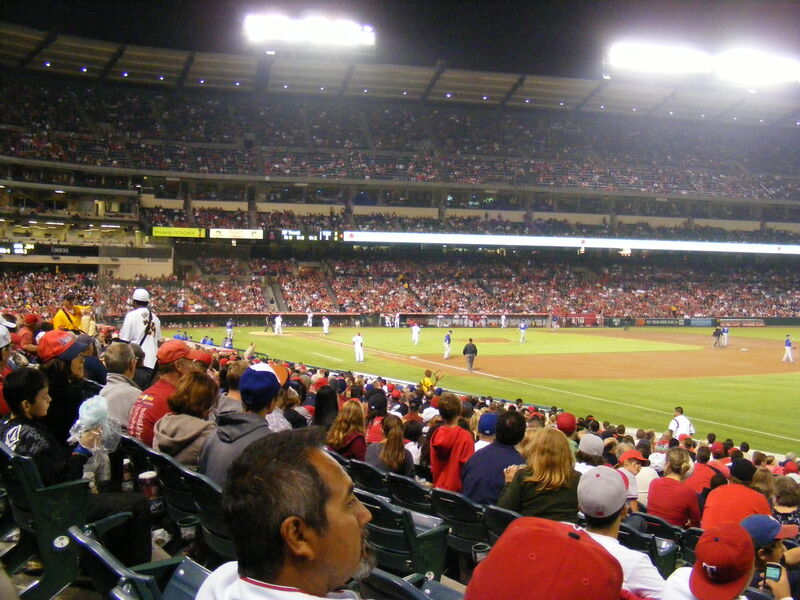 and only gave up one run, and though the Angels tried to mount a comeback against the bullpen, it wasn’t meant to be. As I was positioned behind the dugout trying to get a ball (or the lineup cards from Ozzie, which came soooo close to me) MLBallhawk, John Witt appeared next to me. After we both didn’t snag anything at the dugout he mentioned that he was going to hang around for some autographs after the game, if possible. He gave me a couple tips and we talked for a while. The coolest thing that happened was that D.J. Carrasco came out and was talking to his family. 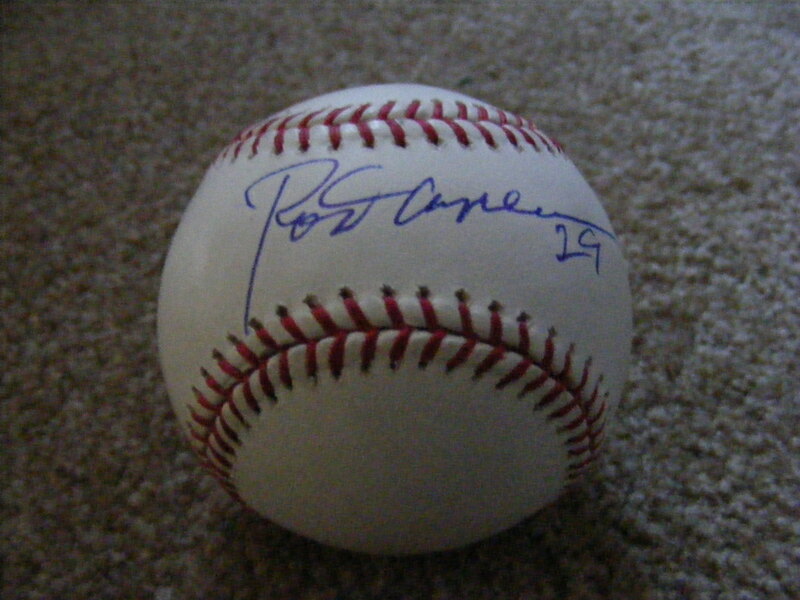 I’d seen a kid ask him for an autograph… so, I pulled the ball he’d thrown me out of my bag and walked over to him. He said, “Sure,” and I handed him the ball and a pen. 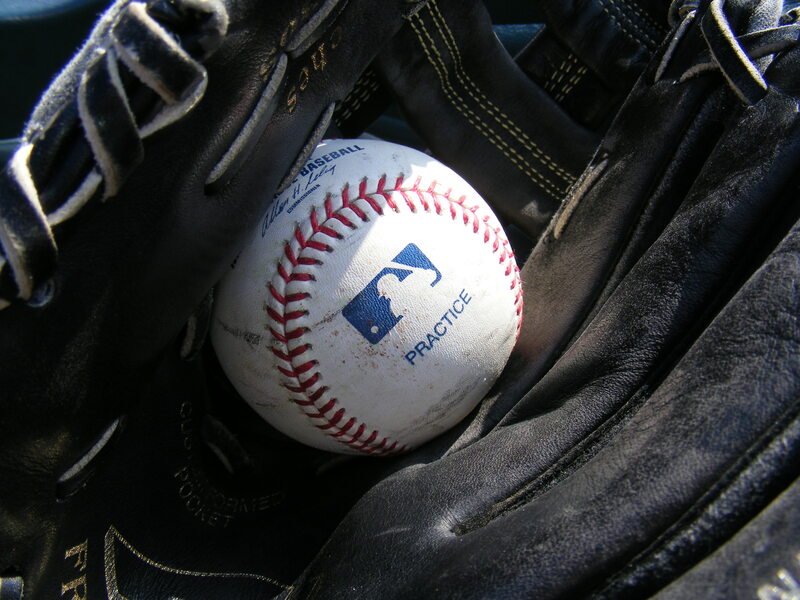 “You’d be surprised how many fans don’t know how to handle using a glove,” he said, handing the ball back. 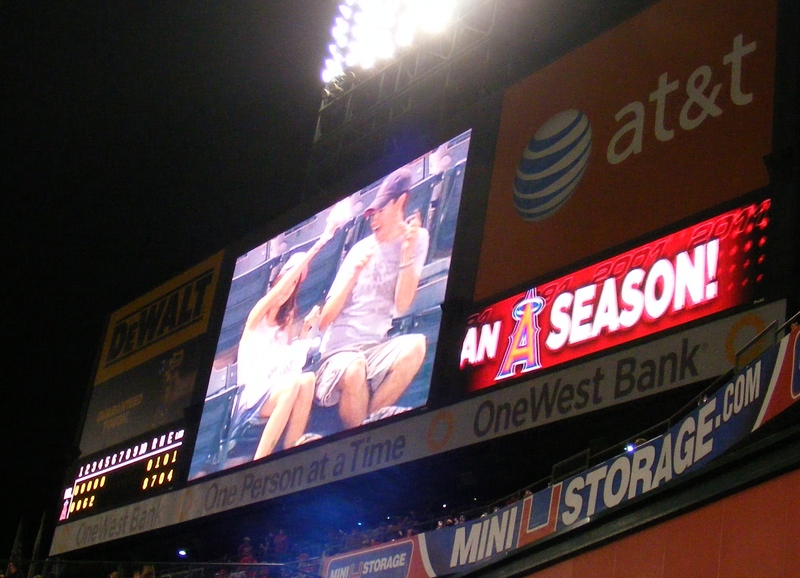 It may be June 22nd before I get to another game… there’s a chance I’ll be able to get to the Padres/Angels on June 13th… I’ve got a little something to do this weekend: marry my lovely fiancee!!! Then it’s her graduation the weekend after that and then a Caribbean cruise for the honeymoon! So, baseball is on the backburner for a while. Thanks for reading!